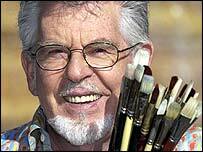 Television artist Rolf Harris has unveiled his portrait of the Queen at Buckingham Palace. The portrait, commissioned to mark the monarch's 80th birthday next year, is said to be an "impressionistic", rather than a "photographic", representation. "I'm not making any claims that this is the greatest painting in the world," said Harris, who trained as an artist, "I've done the best I can." The story of the painting will be shown in a BBC documentary on New Year's Day. "I was really thrilled with the impressionistic look, especially the hands," added the former Animal Hospital presenter. "I really like the way you get the blueness of the veins coming through the skin." However, one newspaper described the image as "blurred" with "unflattering heavy features" . The BBC approached Buckingham Palace with the idea for a BBC One Rolf on Art Special earlier this year and were told the Queen would be delighted to sit for the Australian entertainer. Harris, who has been made an OBE and an MBE, had two sittings with the monarch over the summer. The portrait took him two months to complete. "I would get dressed and switch on the lights and start painting, night after night, sometimes painting for three hours, working on the little details." The Queen last viewed the portrait following the second sitting and remarked that it looked "very friendly". Harris aimed to capture the Queen's "obvious charm and friendly quality". "I wanted to avoid the formal sort of portrait with all the jewellery and pomp and splendour," said Harris. "I wanted to capture the lady as she is with all her humour and reality." He added that the Queen appeared to enjoy the sittings: "I'm only too happy to be sitting absolutely motionless, doing nothing," she told Harris. The portrait will go on display to public at The Queen's Gallery in London from Tuesday. The Queen by Rolf will be broadcast on BBC One on 1 January, 2006 at 2000 GMT.